It really was a typical morning in a Pre-K classroom: the children were gathering on the platform after putting on their coats so that we could head over to the Social Hall to practice our Christmas Pageant. Amidst the hustle and bustle of thirty coats to zip and sixty mittens to find and lose again, one boy jumped off the platform, came up to my rocking chair and asked, “Is Jesus God?” I answered in the affirmative as my eyes were locked on the frustrating teeth of a winter coat. Janie quickly piped in, “But my Mom and Dad say that Jesus is not God.” OK, this girl successfully got my full attention, and I had all the other children’s attention as they sat bewildered, “I thought Sister and our Moms and Dads always agreed!” Meanwhile, I was thinking that a lesson on the hypostatic union seemed a bit advanced, but somehow we were going to reconcile this dogma with the Fourth Commandment in a developmentally appropriate way. I needed some time to brainstorm an action plan, so I quickly began rehearsing the song, “Angels We Have Heard on High,” with the children - complete with hand motions. The Holy Spirit led the discussion from there... “Gloria in Excelsis Deo.” The children finished the song with perfect Latin pronunciation and their right and left pointer and thumb fingers forming an equilateral triangle. “What are your hands doing?” I asked. The children were quick to explain that they were forming a triangle, and they all agreed that a triangle has three corners. Being the intelligent children they are, they remembered that there is One God and Three Persons and that their names are Father, Son, and Holy Spirit. A triangle was quickly drawn on the chalkboard to allow fingers to rest. I pulled a book off the shelf and asked Johnny to show me the beginning of the story. Being the intelligent child he is, he found it at the beginning. I explained that we all had a beginning, but God never had a beginning. Mind boggling, I know, but those kids got it - with the help of “forever” hand motions. We pointed to each corner of the triangle and agreed that the Father is God; the Son is God, and the Holy Spirit is God. Through pure logic, we also agreed that the Father always was, is and will be; the Son always was, is and will be, and the Holy Spirit always was, is and will be. “Holy Spirit, come,” I prayed. “How am I supposed to get them to understand divine and human nature?” I told the children, albeit sheepishly, “God didn’t have a body. I know that’s hard to imagine. He didn’t have eyes, toes, or fingers. But, you know Adam?” The children all nodded. “Well, remember? He made the first bad choice. That was a big problem, because the gates of Heaven were closed. God needed eyes, toes, and fingers to open them.” Ah! Ha! One child shouted out, “So, He became a baby!” “Yes,” I whispered (for fear that the hypostatic union excitement would begin a chain reaction of hyper-static chaos in the classroom). “But which Person do you think became the baby?” “The Son!” they shouted. “Yes!” I whispered, “One day, God decided that it was time to begin to open the gates, so he became a tiny baby, named Jesus, in Mary’s belly. God had never had eyes, toes or fingers, but on Christmas He showed the whole world his body.” You could hear a pin drop, and I had tears in my eyes as I watched their eyes marvel at the mystery of God made Man. We toured the Trinity triangle again to make sure there were no more heretics in the room. They all agreed that each Person was God and that each Person always was, is and will be. They all agreed that the Son was the only Person to get eyes, fingers, and toes to open Heaven. The stickler teacher that I am, I tested them through a newly phrased thought process at the end: “Is the Son God?” “Yes.” “Did the Son have a beginning?” “No.” “Is Jesus God?” “Yes.” “Did Jesus as a baby have a beginning? “Yes!” They got it! I returned to the normal hustle and bustle of coat zipping, but the triangle drawn out of chalk and the baby doll that served as the Baby Jesus prop had transformed the classroom into a Council of Chalcedon for ten minutes and had transformed my heart with a greater dosage of gratitude to the God who “so loved the world that He gave us His only Son” (Jn 3:16). As I drove to the retreat the evening of May 24th, I wasn’t quite sure what to expect. I was looking forward to getting the chance to meet more young women who were also discerning God’s call for them, and of course I was excited to get to know the Carmelite Sisters of the Divine Heart of Jesus, as well. In these moments before the retreat began, I could never have guessed the beautiful experiences I was able to have over the next few days. As I arrived and anxiously greeted some fellow retreatants, my heart was filled with joy and my nervousness began to be replaced with warm happiness. The retreat opened with prayer and welcome, and one of the sisters reminded us to go through this retreat knowing that God had placed us here for a reason, and that through it all his gentle love would guide us. We then prayed compline (the night prayer of the liturgy of the hours) with the sisters, and as we headed to bed, I still had a million questions in my mind about if I was in the right place or doing the right thing, or even of I was worthy to be there. God would not answer these questions in a flash of lightening or a heavenly vision, but through the gentle promptings and experiences of the coming days. The next morning, we opened with lauds and meditation, and I looked to the days ahead, I simply asked our Lord to make His will mine, and to give me the courage to hear His voice more clearly. After breakfast, as we watched a vocational film and listened to the unique and beautiful vocation stories of the sisters, my heart was pulled to the life I was hearing about. “I want to live for you, just like that, Jesus!” I prayed. As we continued through out day and got to experience a little taste of the Sisters' apostolate, I found my heart open to a central part of the Sisters' lives and exactly how they lived for Jesus as I so longed to. Seeing firsthand how the sisters cared for both the residents of St. Agnes Home and the children at the day care, I saw a type a motherhood I’d never fully recognized: spiritual motherhood. The way that the Sisters interacted with and cared for the residents of St. Agnes Home was truly the same as how I love and care for my own grandparents, and the way they played with and so dearly loved the children at the day care reminded me of the relationship I have with my own older sisters. The sisters loved and made a home for everyone they served, with the light of Christ so clearly touching others through their service. That evening as we prayed vespers and then shared recreation time all together, I felt the peace and love between the sisters permeate my heart and the hearts of the retreatants, and I began to understand that not only are the sisters spiritual mothers, they are a spiritual family unto each other as well. The next day, as we had the privilege to attend the ordination mass for priests at the Saint Louis Basilica, and we learned more about Carmelite spirituality and the history of Carmel DCJ, I saw that religious life is not only one of love and sacrifice: it is a life full of the beauty of God. It is a life full of relationships, service, prayer, community, solitude, and bringing the souls of the world closer to the Lord. Learning an introduction to how Carmelite spirituality is lived revealed to me how deeply important the silence of prayer is, as well as how powerful. And attending the ordination mass, as well as some amazing conversations I had with the sisters throughout this weekend exposed to me one very important truth: Religious life isn’t about being worthy or doing things right all the time – it is about answering a call. As we had mass the next morning, on the closing day of the retreat, I knew I had been in the right place, and that I would remember this weekend for years to come. The Easter season is one of my favorite times of the year. This is not due solely to the fact that we can eat chocolate at breakfast, dinner, and supper (part of a certain convent tradition), though that is an amazing gift from Jesus! It is also because I love the Mass readings that the Church gives us to contemplate, which are so incredibly beautiful and intimate. God desires relationship. It wasn’t solely in that split second in the upper room that Jesus revealed Himself to His disciples, nor was His revelation limited to His awe-inspiring miracles or profound words. In everything that He did He revealed His Heart and the love of the Father - every look that He gave, every smile that played on His lips, every one of His actions. He desired that the disciples come to know Him, and through this intimate knowledge of Him, to come to trust Him and believe in Him. And so it is the same with us. Jesus is unceasingly inviting us to encounter Him in the scriptures and in the sacraments. He invites us to recognize His intimate presence in all of the events of daily life. He invites us to share our hearts with Him and listen to the response of His Heart in personal prayer each and every day. He invites us to come to know Him, to grow in relationship with Him, to receive Him in His longing for us, and then to let Him transform us through our trust in His word. He invites us to trust that He is God, He is faithful, and He is the fulfillment of all our desires. 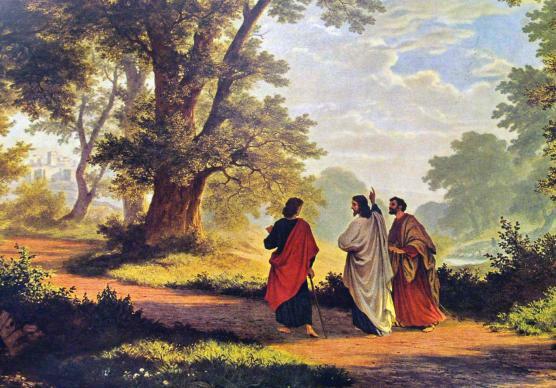 As we continue to contemplate the scriptures this Easter season may we not only pray, “Stay with us Lord,” as did the disciples on the road to Emmaus, for He is always with us. He does not leave us. It is we who get distracted and leave Him. Thus, may we hear His gentle plea borne of His longing and intense desire for us – “Stay with me! Abide in me.” May we resolve all the more firmly to respond to this intimate divine invitation. Amidst the buzzing of technological distractions today, one might say we have muted Christ’s knocking on our hearts. It was not until giving up my own “beloved” Android Samsung, that I was able to see just how often I was running from silence by checking it all throughout the day. How long, I wondered, has Jesus been waiting to enter the silence of my heart, just for me to turn away and check my phone? With this in mind, I couldn’t help but worry, how will children search for Christ in a world that offers so many distractions? Only a few weeks in our Carmelite Child Development Center proved to me that Christ goes much deeper than the distractions of the world. One encounter I had speaks for them all. While working on an art project, a few children had crowded around my lap and began asking questions about the crucifix around my neck – nothing new. “Why did Jesus want to die for us?” and “How can I be better friends with Jesus?” were only a few of their remarks. All the while, one little girl, “Ruth”, gently held the little cross in her hands, gazing at it intently. Eventually the questions ceased, the children returned to their play, and I refocused my attention to the painting station. Without noticing that Ruth was still hanging on to the crucifix around my neck, I continued directing the project. After a great silence passed Ruth finally looked up, “Sister,” she asked quietly, “Can we keep talking about Jesus? I like it and I really want to know more.” Such sincere words! Suddenly all the children painting had stopped to listen to me, eagerly waiting to hear more about Jesus. How beautiful it is to witness the joy of little ones seeking to know Christ. Is this not the cry of each of our hearts? Lord, help me to desire to befriend you, just like your little ones at Carmelite. The incredible power of a mother! I have recently taken to calling it just that, “mommy power”. As women, we can easily lose sight of our “feminine genius” - the ability to give birth to love, a love conceived by a posture of receptivity to Love. It is thus that a mother’s strength is manifested, giving birth to this love time again and again, through her tender availability, compassion and receptivity to the other. Not too long ago, I shared with my own mother a very deep struggle I was enduring. In her efforts to comfort me, she likened my struggles to that of another story she had heard. I stopped her. I said, “Mom, I’m hurting right now, and I really need you to use your ‘mommy power’. You have the ability to ease my pain simply by hugging me. You can kiss a boo-boo away. And I have experienced my pain lessening just by you praying with me and taking my sufferings to yourself. Please . . . use your ‘mommy power’ now.” And with that we both stopped and she entered into my suffering, we cried together . . . and I stand here to bear witness to the truth - there is nothing that can withstand the power of a mother’s love. Let us give praise and thanks to God on this Feast of Our Lady of Guadalupe for sending us so beautiful a mother. May she intercede for us for the grace to be receptive to His Word so that we may become spiritual mothers to all of His children on earth. May they know His love and compassion through our own “mommy power” – easing the pain of a suffering world through our acts of love. ¡Viva de Virgen de Guadalupe! Easter Monday I found myself at a lake house in Innsbrook, MO with an opportunity of a lifetime... To my great surprise there are horse stables connected to this lake house community; and for me, a long-time horseback rider, the thought of seeing a horse filled me with excitement. You see, horses were one of those things I “gave up” to come to the convent and in the developed town of Kirkwood horses are scarce. So what did I do? I begged my sisters to take me there and they happily complied to my request. In the matter of minutes I found myself stroking a chestnut Tennessee Walker and having the time of my life just being near this beautiful animal. Her name was Willow and she was a sweetheart. With the permission of her owner, we spent the next 45 minutes together and this time resulted in a great horsie/Sr. M. John Paul bond that I’m sure never to forget. So our Lord really does mean what He says! He knows and cares for our needs and even our littlest desires- we just have to give Him the opportunity to provide! God’s plan for us is infinitely greater than our own. If you are anything like me, at some point in your faith journey, your discernment has to be purified. Jesus will ask us point-blank, at some specific time: My daughter, are you living for you, or do you want to live for Me? He leaves us free; But we know that the choice we make will bring us closer to Him and to the fulfillment that can only be found in His Heart. Understandably, we are mostly driven by fears, insecurities, and anxieties when we are still young in our faith journey. We are all affected by original sin…which led us to have trust issues with God our Father. This enters into our discernment as well, anxiously questioning: What does God want of me? Will I miss His plan? What if I choose the wrong path? The thing we so often forget is that God is our true Father. God is a Father who wants us to know the path infinitely more than we want to know it. He is our Daddy who picks us up when we fall and hurt ourselves and holds us until we calm down and rest against His heartbeat. Surrender to our Father. Growing in that relationship with the Father is key. Before discernment even begins, we need to orient ourselves to a God who loves us unto death. So knowing the path isn’t the key. Trust and surrender to His perfect timing is. Speaking with girls who are discerning their vocations, I often find myself remembering so well what it felt like to be at that time of life: high school/ college-age, wondering what the next great step in life would be. ...Then came the waiting and waiting for what seemed like an eternity for God to reveal His path to me and for me to “actually get started” with my life. God must have smiled a lot upon me in love, gently telling me to “wait”. His perfect plan was coming! I just needed to live in the moment and hold on just a little bit longer. I often grumbled, wondering why He wasn’t telling me what I wanted to hear, namely that, “you have a vocation!” But it wasn’t an experience like a clear-cut voice that told me I was called to be a sister. It has been a journey all through formation here in the convent where I have been learning how to surrender to my Father in JOY, peace, serenity, healing, and hope. It has been a time where the “yes” I say when I renew my vows each year until final vows becomes freer and more authentic. This paradoxical journey is one that typically I wouldn’t have thought would bring me freedom, but it has and it continues to do so.